Happy New Year Everyone! 2016 was a wonderful year in terms of crafting, I started this blog and at the end of the year I discovered Instagram. I learnt a lot about photographing cards from my sweet brother who is totally professional. I tried a lot of new techniques too and I can clearly see that practice makes a difference if I compare my cards from last year and this year. I wanted to say goodbye to this lovely crafty year in style and greet 2017 with lots of expectations and hope and cheer. So here is a card I made for my brother, it is a freebie from Gerda Steiner Designs, coloured with Shinhan alcohol markers, and “lifted up” with lots of shimmer and glossy accents. I added a frame using metallic silver cardstock and an MFT frame die, and i made a mat for the frame using some Hero Arts rectangle dies to cut a piece of black glitter paper. The sentiment i printed under the image. I will play along with the Simon Says Stamp Monday Challenge Party time. I will also upload this card to the SSS Wednesday Challenge Anything goes. I hope you like it and I will see you next year too. I am popping in to share a probably last post this year as my laptop needs to be maintained and I will not have blogging opportunities. I wanted to post a New Year card, but as usual I am last minute crafting and none of my cards are ready 🙂 So I decided to show a flower birthday card instead which I made for the mum of a friend of mine, whom I really adore. First I stamped the WPLUS9 bouquet on alcohol ink friendly paper (I recently started using Copic Xpress-it, and it IS the best for me till now) and coloured in with Shinhan Touch Twin markers. I got some new colours and wanted to give them a try. I used a Spectrum Noir clear shimmer pen, a silver gel pen and some glossy accents to highlight some details. I cannot imagine any card without these finishing touches. I die cut my panel with a SSS frame die and using the same die I cut a silver piece too for the actual frame. I glued them all on a light pink card base. The sentiment is a Hungarian die and stamp (Scrapfellow) combo, it means “with love for your birthday”. As I was mailing this card I didn’t dare to add sequins (I usually hand deliver my cards to the recipients), but rather embellished the matching pink envelope with images from an Altenew stamp set. 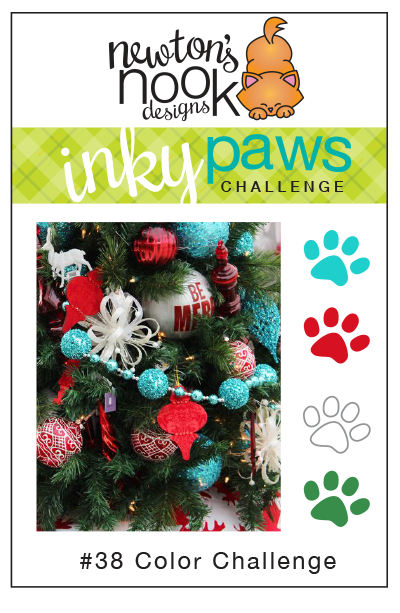 I will submit this card to the SSS Wednesday challenge Anything goes and to SSS Work it Wednesday December too. Hope to see you soon and all my best wishes for the upcoming new year! I didn’t plan to have such a long break, but somehow I was so busy with last minute cards/tags/calendars before Christmas that I could not post anything of what I was working on. So bad, next year I need a better planning. The card I brought today is the one I made for my parents as a Christmas note. 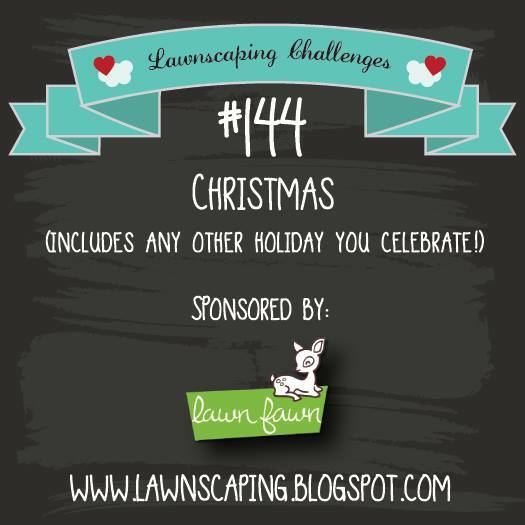 Also it is my entry for the last Lawnscaping Challenge #144. I feel so sad that this challenge blog is closing, I really enjoyed it and have just started to make cards for it recently. But back to the card, I made a winter scene with lots of dimension and colouring, because my mum likes it this way. First I stamped and coloured the images from the Frosty friends stamp set and cut them out with the coordinating dies. I used Shinhan alcohol markers, added some details with a white gel pen, Spectrum Noir shimmer pen and of course with glossy accent. The background is made using distress inks and I used a snowfall background stamp with Versamark/white embossing powder when it was dry. I cut 2 slopes from white cardstock and stamped my Hungarian greeting on the first layer with Versamark ink and heat embossed it with red embossing powder from WOW. I assembled the card using foam tape for more dimension. The snowy details I made with the Marvy snow marker which puffs up when heated. I love this marker so much! As a finishing touch I added some white glitter droplets to the tree (which is from another Lawn Fawn set). I wanted to share with you a card set I made for my daughter’s KG teachers. She is in the Hedgehog group so I was sure I need to use the sweet hedgehogs from Birdie Brown (MFT). I stamped and coloured my images with Shinhan alcohol markers, added some clear shimmer with a Spectrum Noir shimmer pen, a white gel pen, a Sakura stardust glitter pen and some glossy accents. I also used a layering tree stamp from Hero Arts and Altenew green inks in different shades. The last layer I stamped with Versamark and embossed with white puff embossing powder from WOW. I die cut everything with their coordinating dies (that is my favourite part after colouring). The little present is from a Neat and Tangled set. For the background I used distress inks in 3 shades of blue and I added snow paste through a SSS Snowfall stencil. I cut a piece of white cardstock with a stitched hillside border die from Lawn Fawn. I stamped my Hungarian sentiment in Versamark and heat embossed with red embossing powder (WOW). I used 3D foam tape to add more dimension. I love the result, it is one of the sweetest cards I made this season – for me at least. I hope you like it too. I am entering this project in the SSS Monday Challenge Let there be snow and SSS Wednesday Challenge Gift it. 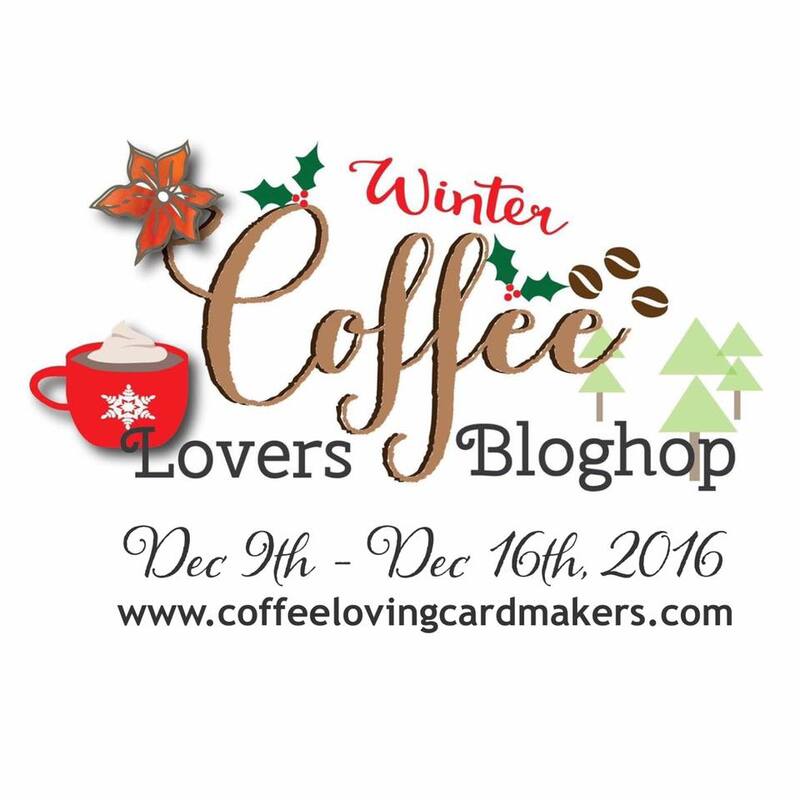 This is my second post today as i was in a funny mood and had to create another coffee themed card for the Winter Coffee Lovers Blog Hop. I started with stamping a coffee cup image from Create a smile, coloured it with Shinhan alcohol markers and fussy cut it out.I added some clear shimmer on the top and the sleeve, and even more shimmer to the heart, which i also covered with glossy accent. Then i ran an A2 sized kraft cardstock through the big shot using the stitched swirls background die from SSS. For the sentiment i die cut the word Believe (SSS) from dark red cardstock and its shadow from bronze metallic cardstock. The rest of the sentiment is pieced together from different sets. I popped up the cup with foam tape and added a few PPP clear sequins. That is all from me today, for a little while i will be back to Christmas cards as i am still preparing them for my friends and family. How to make me happy.. I die cut the gift box cover up die from MFT from Lawn Fawn patterned paper and 2 times from thick white cardstock. I layered them on top of each other for dimension. I cut a piece of snowflake patterned paper as my background (Doodlebug) and stamped my sentiment from SSS in the lower right corner in black ink. I also added a custom sentiment using another SSS stamp set and pieced it together (pun intended as I wanna give this card to my husband). Next was stamping: I chose the super cute and funny images from YNS, coloured them with Shinhan alcohol markers and added some gloss to the mugs and the noses. I adhered the die cut images with foam tape. As extra embellishment I sprinkled some PPP clear sequins all around. 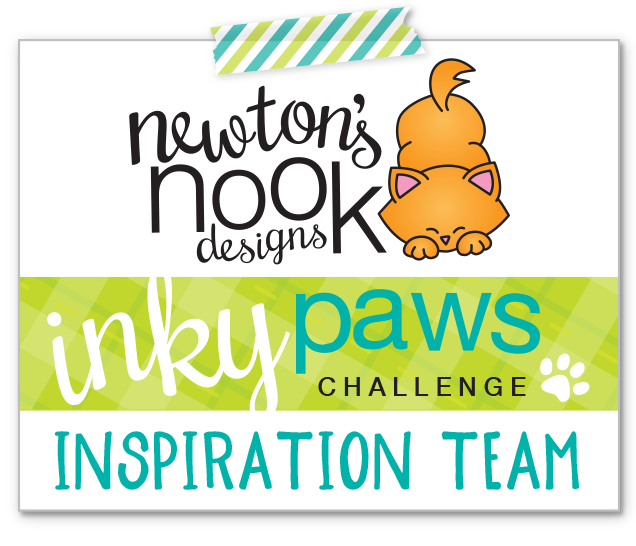 Today I brought a fun card I made for the Inky Paws Challenge #38 from Newton’s Nook. First I die cut a double stitched white rectangle and stamped my kitty with the hanging ornament on it, coloured with Shinhan alcohol markers and added some extra details using my favourite finishing touches: some clear shimmer with Spectrum Noir shimmer pen and glossy accents. I silver heat embossed a Neat and Tangled sentiment, I felt the playful font matched the naughtiness of my kitty. To hang the ornament I die cut several green leaves with an MFT die, glued them flat n the top of my stamped panel and I used a silver string with a bow. I gave this panel a vivid green mat and glued it on an A2 sized patterned paper from Doodlebug, which matched the challenge criteria and my image. I used a simple white A2 card base. I hope you like my card and will return soon, I still have a ton of Christmas inspiration waiting to be blogged.